* The Upgraded Teaching Pack is for the members of IACT (Irish Association of Chinese Teaching) only. If you are interested in becoming a member, please register through the link below. Based on teachers' experience and students' feedback on the previous version, UCD Confucius Institute for Ireland has worked closely with both Irish and Chinese teachers who teach Chinese programmes in schools to produce the Upgraded Teaching Pack. 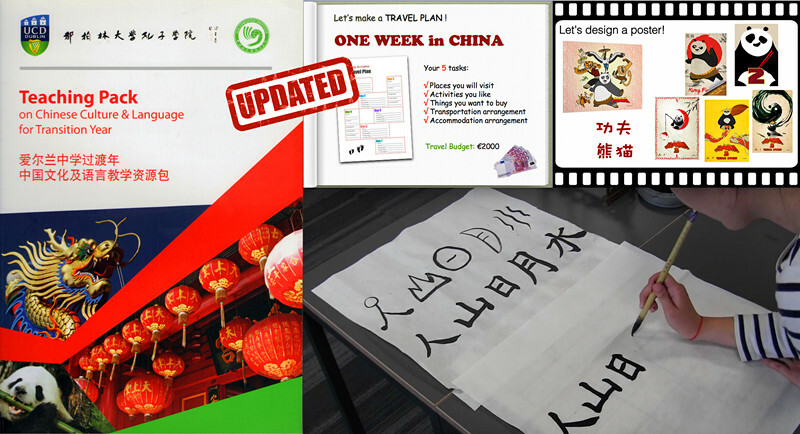 Compared to the previous version, this Upgraded Teaching Pack provides teachers with more teaching materials to teach Chinese language and culture, particularly the instructions (both by videos and by PowerPoint shows) for organising various class activities. It has also added new content and features to make teaching more interactive and student centred. Moreover, an open platform will be established on the official website of UCD Confucius Institute alongside with the launch of the Upgraded Teaching Pack, in which teachers can exchange their ideas and experiences in using the Teaching Pack to teach Chinese language and culture that will contribute to the continuous process of updating the Teaching Pack. In order to make the Teaching Pack more user friendly for both Irish and Chinese teachers to teach Chinese culture and language in schools, the upgraded version is comprised of four new chapters along with original topics. These four chapters are video introductions and tutorials of learning Chinese through songs, learning Chinese with games, Chinese calligraphy, and Chinese painting. This Teaching Pack makes use of knowledge on all aspects of China and Ireland, with innovative ideas to create a pleasant learning environment for students. The staff at the UCD Confucius Institute have spent three years completing the Teaching Pack and adapting it to the needs of Irish secondary school Transition Year teaching styles. It incorporates innovative methods and extensive resources for student-centred overseas Chinese teaching. Focusing on Chinese culture and also Chinese language, the Teaching Pack entertains the students while also educating them, which suits the teaching requirements of the Transition Year. Having given full consideration to the psychological traits of secondary school students whilst choosing the topics and content, the Teaching Pack emphasizes the involvement of students in class activities, thus creating a student-centred atmosphere. While having certain interconnections with, each topic is complete and independent, providing a chance for the teachers to choose whichever ones they like. Local resources in Ireland have been used to enrich the teaching content: The resource package has been designed specifically for Irish teachers; the content is all written in English; Chinese vocabulary teaching content is equipped with audio bites for ease of pronunciation; content includes not only classic, rich Chinese cultural themes, but also corresponds to the relevant Irish examples which teachers and students are familiar with, and in turn helps to eliminate the strangeness students may feel in the process of learning Chinese culture and language. Combined with the knowledge Irish teachers have of their students and what they have learnt in the past or are learning at present, the flexibility of topics is ideal. The Teaching Pack of the Chinese language and culture course descriptions have been approved by the NCCA, and 14 sets of PPT courseware have been produced. The 14 topics are: General introduction, Secondary school life, Music and Chinese opera, Chinese food and tea, Chinese history, Chinese economy, Chinese festivals, Chinese traditional medicine, Chinese characters and calligraphy, Chinese sports and Kung Fu, Chinese family, Chinese handicrafts, Travel in China and Chinese films. These 14 topics also contain the relevant background cultural information, notes and lesson plans, designed to reduce Irish teachers’ lesson preparation time, reduce the difficulty of teaching this subject and to better integrate the subject with other subjects and disciplines. Using advanced digital technology as a tool to improve teaching: The Teaching Pack contains 14 sets of PPT courseware multimedia teaching materials such as audio, video and animation to bring this ancient culture to life through fresh new and vivid visualizations. The use of these advanced technological means, not only raises the students’ enthusiasm, but also enhances the operability of the teaching itself, so that the local teachers' limited understanding of Chinese language and culture, after brief training, is of no impediment. This in turn helps to promote Chinese and the teaching of Chinese culture to promote a smooth expansion of the Transition Year programme. The three years of effort put in to the Teaching Pack have finally achieved great success. From the very start to publication, the Teaching Pack has undergone numerous modifications. Throughout the future use and promotion process, we sincerely hope that users at home and abroad will give valuable advice to help us further improve and enhance the resources.